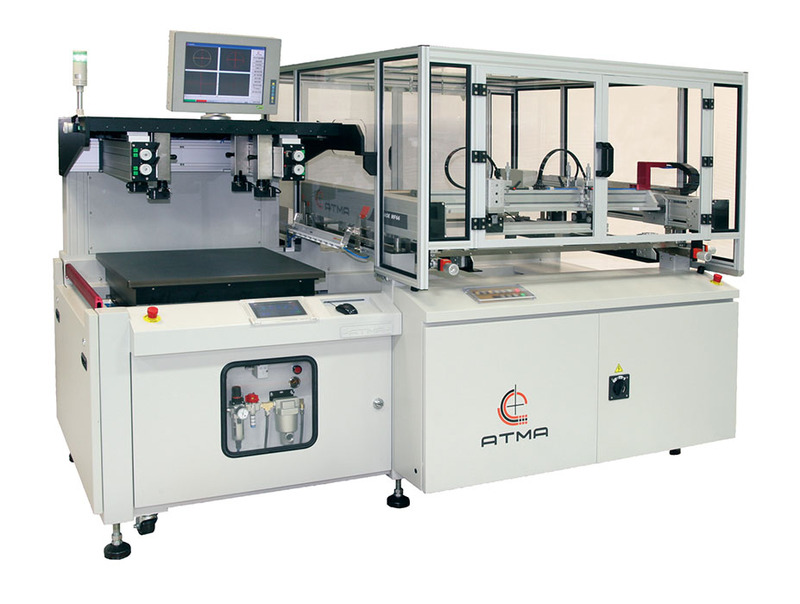 Precision automatic screen printing machine to meet highest demands, with 4-post system, CCD-camera system and movable print table to produce high-quality prints on flat materials such as EL-foils, LGP panels, BEF-films, touch screens, membrane switches, flexible printed circuits, and much more. The material is loaded manually onto print table in home position. The print table moves back to home position. The material is then taken off print table manually. Latest G7 version four-post high precision with right/left sliding table and CCD registering system for precise registration and high productivity. State of the art structure is solid and light-weight, with top class transmission (6 sets of servos plus AC motor) and precise leading registration system, rapid operation, smooth movement and silent operation. Dripless squeegee, fixture clamps, pneumatic registration pins, automatic input/output, and more. Max printing area 800mm x 800mm 31.5" x 31.5"
Min printing area 300mm x 400mm 11.8" x 15.7"
Substrate thickness 0.3mm to 6.0mm 0.012" to 0.236"
Machine dimension (W x D x H) 3060mm x 1854mm x 1910mm 120.5" x 73" x 75.2"
Max frame O/D size 1300mm x 1300mm 51.18" x 51.18"
Min frame O/D size 1000mm x 1000mm 39.37" x 39.37"
Screen micro adjustment X ±10mm ± 0.393"
Screen micro adjustment Y ±10mm ± 0.393"
Screen micro adjustment Z ±2mm ± 0.0787"
Peel-off height 0 to 30mm 0 to 1.18"
Sliding table precise positioning 0.005mm 0.000197"
XY registering accuracy 0.005mm 0.00019685"
Registering table size 800mm x 800mm 31.5" x 31.5"
Max printing stroke 0 to 950mm 0 to 37.4"
Effective printing stroke 0 to 860mm 0 to 33.86"
Delay print 0 to 200mm 0 to 7.87"
Delay peel-off 0 to 400mm 0 to 15.7"
Adjustable pressing depth 0 to 12mm 0 to 0.472"
Screen stand-by level 30mm 1.18"
Screen cleaning level 350mm 13.78"
Screen lower margin precision ±0.01 mm ± 0.0003937"
CCD shooting image area X=±132.5 to ±405mm / Y=±405mm X= ± 5.2" to ± 15.9" / Y= ± 15.9"
Visual registering precision 0.005mm 0.00019685"
CCD FOV (HxV) 10mm x 7.5mm 0.39" x 0.295"